Kids Math Teacher: Math activities with Eggs! So many fun things to do with eggs, but my all-time favorite is Fractions with egg cartons. Fractions with egg cartons has been around for a while, but I'm not sure how many teachers and parents know how many levels of fractions that can be done with them. You can practice identifying fractions, adding fractions, subtracting fractions, multiplying fractions, and dividing fractions. And while doing those you can talk about fraction equivalents, mixed fractions, and improper fractions. Hopefully I didn't lose you there, but I will be posting specific lessons later on, but here are a few examples of what to do with EGGS and egg cartons. Egg Carton Fractions: While you work with eggs, you might go with the plastic eggs instead. Also, using a picture of the egg carton may be best when recording your findings. Have fun seeing the different ways the eggs fit in the carton. What fraction is that? 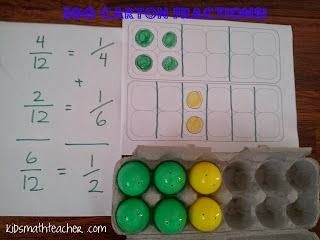 Have fun exploring all the things you can do with fractions using egg cartons! Write numbers on your eggs and put that many items inside (jelly beans, blueberries, choose anything that will fit.) Have kids find the eggs and practice adding up their total. have baskets labeled 1, 2, 3, etc. representing the answers and the kids have to put the eggs in the basket. Next time you cook with eggs, put them in a measuring cup for liquids--What's the volume inside 1 egg, 3 eggs, etc. Make up word problems to solve involving your family. If everyone has a two egg omelet once a week, how many eggs would you have used over one year? Have you played math games with EGGS before? The more advanced math is great too! You could also use water displacement to find volume : ) As for the radius and volume, to find those eggact (haha) measurements I think calculus is required. The volume problem was solved in antiquity, long before the invention of calculus. Have the kids measure egg volume by displacing water in a measuring cup. Make sure they shout "eureka!" once they get the answer. I love the examples and pictures!! These will be great for my intelligent, math-phobic sons! Wow. This will be great for 3rd grade. They haven't started fractions in 2nd. I still use M&M's and Cheerios for math help at home. I love these! I know my girls will love these activities. I could have used something like this when I was in school. I'm terrible at math, lol. I used to work with a third grader... my poor third grader who got bored with my pizza fractions. I wish I had your ideas back then! You are very clever! This is a fun way to learn fractions. I am impressed! What a cool idea! I taught music for many years, and this would have been great in my classroom too (since rhythm is nothing but fractions). I commend you for your creativity, and I hope you continue to love teaching! Oh how cool is that. Maths was my favourite subject but this would have made it even more fun. thanks for sharing. Dropping by from AtoZ. This is a cool way to visually enhance fraction learning. Thanks for sharing this idea--it is excellent!